THE NIDF IS FOR ALL DANCE COMMUNITIES – CULTURAL AND CONTEMPORARY DANCERS, COMMUNITY DANCE GROUPS AND INDEPENDENT ARTISTS – TO GATHER TO DISCUSS OUR NEEDS IN COMMUNITIES ACROSS AUSTRALIA. THE NIDF IS PART OF THE BULLARTO WONTHAGGI (EVERYONE GATHERING TOGETHER) PROGRAM OF YIRRAMBOI FIRST NATIONS ARTS FESTIVAL. THE NIDF IS FOR PEOPLE WHO WANT TO BE ACTIVELY INVOLVED IN DEVELOPING A NATIONAL ACTION PLAN FOR INDIGENOUS DANCE AND ARE WILLING TO WORK WITH OTHERS FROM ACROSS THE COUNTRY IN THE COMING YEARS TO MAKE IT HAPPEN. IT WILL BRING TOGETHER REPRESENTATIVES FROM AS MANY REGIONS AS POSSIBLE. 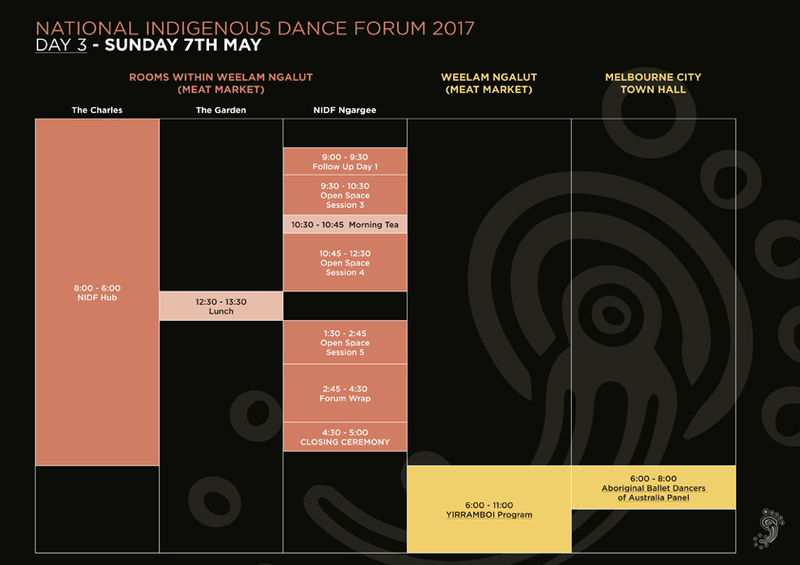 “When you come to the National Indigenous Dance Forum, you have to be really clear about what your purpose is, be strong and determined to fulfil that purpose. Be aware of where you are and have a sense of place.